Airborne maneuvers are for experienced riders only. Snowmobiles provide an adrenaline rush and a great way to spend a winter day. Driving the snowmobile is simple in concept but some things are easier said than done. 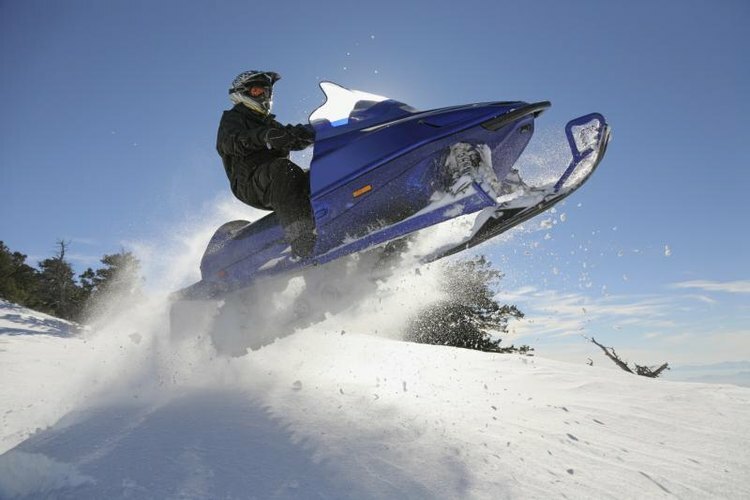 Snowmobiling is a fast action sport that requires quick reaction times. Driving on flat trails is ideal for the beginner but riding off-trail in varying terrain is the goal for more advanced riders. Always start and idle the snowmobile for five or ten minutes before riding. Warming up the machine before heavy use gives the motor a chance to lubricate and reach operating temperature. Put the machine in the neutral position and start on flat ground if possible. Turn the key to the "on" position and close the choke. Either push the electric start or pull the start cord. If the motor does not start immediately, try again. If the motor does not start on the second try, make a quarter turn on the throttle. When the motor starts, slowly open the choke and work the throttle until it has a stable idle. Trail riding is the first step for beginners and a means of reaching great powder for the experienced. Sit comfortably with your feet on the side rails and your hands on the handles and throttle. Flutter the throttle to move forward while keeping your weight centered on the machine. Follow the groomed track at a comfortable speed and gradually increase speed on straight sections to feel out the machine. Lean into the curves, shifting your weight completely over the side of the machine. Hit the throttle hard if you slide off the trail and into powder. Lay on the throttle until you return to the groomed track. Backing off the throttle in powder will sink and tick the machine. Riding in deep powder requires a more aggressive approach than riding trails. Keep the throttle at high levels to push through the powder. React to changes in the terrain to keep the machine upright. If the snowmobile pulls right, shift your weight left to adjust the direction. Making body-weight adjustments while steering is the key to navigating powder and difficult terrain. Fresh snow without trails is the most difficult and the task is physical. You must have a strong upper body to steer the machine. Hills are technical and in some cases dangerous. Riding on an incline increases the risk of rolling the snowmobile. Shift your weight to the rear section of seat on the uphill. Ride with one knee on the seat and one foot on the side rail for the best control. Lean your body forward to place pressure forward on the handles. Place your feet on the forward sections of the side rails and lean back when going downhill. Shift your weight to the uphill side when riding on a side-hill. Rest your knee and shin on the side rail for comfort and lean hard into the hill.